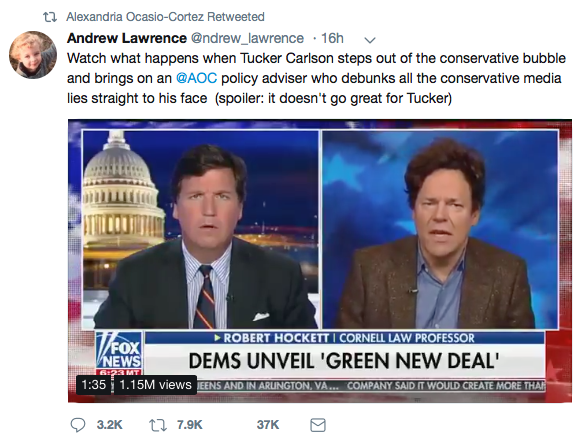 Carlson asked Hockett about the Green New Deal guaranteeing "economic security for all who are unable or unwilling to work." "Apparently some Republicans have put it out there, I don't know the details," he said. 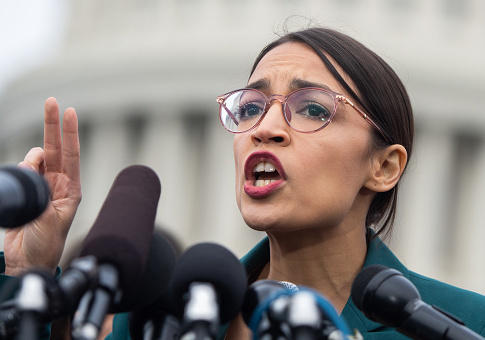 Ocasio-Cortez's 14-page resolution calls for the "economic transformation" of the United States through a "Green New Deal mobilization" that would phase the country off fossil fuels and nuclear energy in 10 years. Renewable energy accounts for just 17 percent of current electricity generation. The deleted supplemental document explained the Green New Deal further, saying that the plan would "create economic prosperity" by planting "lots of trees." But Ocasio-Cortez's office was honest about the plans limitations to "fully get rid of farting cows and airplanes" in 10 years. "We set a goal to get to net-zero, rather than zero emissions, in 10 years because we aren’t sure that we’ll be able to fully get rid of farting cows and airplanes that fast, but we think we can ramp up renewable manufacturing and power production, retrofit every building in America, build the smart grid, overhaul transportation and agriculture, plant lots of trees and restore our ecosystem to get to net-zero," Ocasio-Cortez's office said.